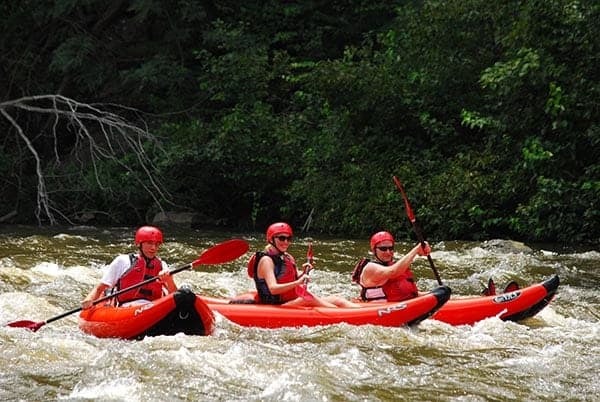 While Smoky Mountain Outdoors is most famous for our white water rafting adventures, we also offer very popular inflatable kayaking trips on the Lower Pigeon River. Guests choose from either a single or a double kayak and then spend an hour and a half surfing and splashing through Class 1 and 2 rapids. Unlike white water rafting, kayaking in Gatlinburg puts you in the driver’s seat, as each guest gets to steer their own boat! 1. Kayaks are at least 4,000 years old. The history of kayaking dates back at least 4,000 years! If you happen to find yourself in Munich, Germany, you can see the world’s oldest surviving kayaks in the North American section of the Museum Five Continents. These kayaks are from the year 1577! 2. Kayaks were invented by the native people of Arctic North America. The first people in the world to build and use kayaks were Inuit, Aleut, and Yup’ik people. Often referred to as “Eskimos”, these indigenous people live in modern day Greenland, Canada, and Alaska. 3. The word kayak means “hunter’s boat” or “man’s boat”. kayaks were originally designed for hunting. These small boats were perfect for creeping up on animals that lived in the water or along the shore. Common prey included seals, caribou, and whales. 4. The first kayaks were made from animal skins and whalebones. If you think blowing up an inflatable kayak is a lot of work, imagine building one in the 1500s! The Inuits and other native people made their kayaks by stitching animals skins together (often from seals) and stretching this material over a frame made from wood or whalebone skeletons. These early kayaking pioneers also used whale fat to waterproof their boats. 5. The International Scale of River Difficulty was inspired by an Austrian kayaking trip. Modern kayakers and white water rafters use the International Scale of River Difficulty to classify how strong a river’s rapids are. When we talk about Class 1 or Class 4 rapids on the Smoky Mountain Outdoors website, we are referring to this system. The creation of an international scale came about shortly after an adventurous man named Adolf Anderle became the first person in the world to kayak the Salzachofen Gorge on the Salzach River in Austria in 1931. 6. Kayak races were added to the Olympics in 1936. During the 1936 Berlin games, “flat-water racing” was introduced. In 1948, the Olympics added its first women’s paddling event – the 500 meter singles kayak. The first white water racing event premiered in 1972, and today the Olympics have more than 10 white water competitions. 7. In 2003, the Pigeon River was visited by over 60,000 white water enthusiasts. Since the early 2000s, the Pigeon River has been transformed into a major destination for kayaking and white water rafting. The lower part of the river is ideal for kayaking because it features Class 1 and 2 rapids, which are very fun and completely safe. Now that you know more about the history of kayaking, you can start planning your adventure! If you’re interested in both white water rafting and kayaking in Gatlinburg, be sure to check our our Float and Raft Combo!